For this study, we defined small and medium-sized charities as those whose income falls between £10,000 and £1 million. Small and medium-sized charities are a vital part of everyday life in communities across England and Wales. Many have made the case for sustaining a vibrant and healthy population of small and local charities, but there is little evidence about what is distinctive and valuable about them relative to larger charities and public sector bodies. This study set out to address that gap, and has identified the distinctive contribution and value of smaller charities, the funding challenges they face and what can be done to address these challenges – by funders and by charities themselves. Are 'first responders' to newly emerging needs at a 'hyper-local' level. Create spaces where people feel safe, respected and useful and can access services without fear of being stigmatised. Promote inclusion and belonging by connecting new and established communities to wider opportunities and support. Person-centred and responsive approaches that create the conditions for long-term engagement. An embedded, trusted and long-term presence. Reaching people early and staying longer in their support. Having an open door approach that means people are not turned away. Quick decision making based on flat and responsive organisational hierarchies. Diversity achieved through recruiting volunteers from the local community. The extent and nature of their local networks and relationships, which facilitate an extended reach within and between communities. Their stabilising role at a local level, for which smaller charities are frequently described as the 'glue' that holds services and communities together. Their advocacy work, in particular at an individual level for people in need of practical help to navigate their way through a crisis or address specific and pressing issues. All case study examples on this page are drawn from our work in Ealing, one of the four areas we and our partners researched for the Value of Small report. One organisation in Ealing had a client come to them for help because they were struggling to get an Oyster card. They had gone to the library for help to fill out the application but, because of a language barrier, the library had misunderstood and processed an application for a swimming pass. This was given as an example of the range of things that people approach the charity with. Their ethos is to support people with whatever issue they are grappling with at that moment in time. Individual value - the support small and medium sized charities provide for people facing disadvantage leads to 'soft' personal, social and emotional outcomes - such as wellbeing - as well as hard and more tangible outcomes - such as employment. Economic value - the work of small and medium sized charities creates value directly for the economy as well as value for public services through the individual outcomes achieved. Added value - cross-cutting value for different stakeholders. Meeting needs, including averting and responding to crisis. Helping people to achieve 'small wins', such as building confidence and self-esteem, which provide the necessary basis for longer-term outcomes. Committed staff and volunteers, who create safe spaces with a family feel that encourage long-term engagement. Creating the conditions for longer-term engagement which can lead to more tangible outcomes in the longer term. Their economic footprint was £7.2 billion in 2014-15, much of which was reinvested locally through services and activities that employ local people and utilise local supply chains. The outcomes they achieve provide direct value for the economy, for example by supporting people into employment. They also provide value to the public sector, by helping to reduce the demand for, or cost of, services in areas such as health and homelessness. Volunteering, as they provide many more volunteers per £1 of funding than larger charities; and volunteering is also a source of individual and economic value in its own right. Funding leverage, as they are able to utilise multiple sources of funding and other resources when delivering a service, which means they are often able to more than double income received from the public sector with income from elsewhere. Embeddedness in local organisational and social networks, which gives them an enhanced understanding of local needs and, crucially, enables people to navigate services and know which providers within the wider ecosystem are able to meet or respond to their needs. One organisation said that although the Job Centre sends individuals to Southall College for English Foreign Language (EFL) lessons they prefer to come to the EFL classes run by their organisation as they can also access other services, information and advice when they are there. They said that the EFL lessons are also a way for the staff to find out more about the individuals and their needs, as students often confide things in the teacher, e.g. issues with their neighbours, with homelessness, employability etc. The EFL classes they run are very hands on and practical, e.g. sessions on applying for jobs or visiting the doctor, and are adapted to the needs and circumstances of the students. Each organisation has a strong physical presence in the geographical areas where they work. They run buildings with open-door policies, employ staff who regularly go out into the community, often making themselves available out of hours and recruit local residents as volunteers. During the interviews for this study with the CEOs of two of the organisations, every few minutes there would be a knock at the door to their room from individuals wanting their assistance or advice. Each organisation places a premium on making themselves available to and getting to know and build trust with the individuals that use their services. Small and medium sized charities in our case studies had responded to these challenges in groups and as individual organisations. Streamlining and scaling up contracts. Public sector commissioning is increasingly occurring at scale - contracts are larger, and more tightly defined, which favours large charities. Promoting collaboration between providers. There are some examples of effective collaboration, but this takes hard work and is dependent on considerable levels of trust between key actors. Collectively, at an area level. They feel it is critical to continue to invest time and financial resources in collaborating with other local providers to bridge a gap between communities and the public sector - even when there is no funding to do so. Individually, at an organisational level. Some were focusing on development and capacity building to ensure their long-term sustainability; some on income diversification; and others on how to meet the requirements of commissioning frameworks and larger contracts in the future. These in kind donations are important both as a substitute for income they have lost and as another way to pursue their mission to encourage wider community support for and engagement in the issues that they are tackling. But the donations cannot replace the funding that the charity has lost because this covered running costs as well as the costs of food and personal items. The organisation has since struggled to cover these core costs, e.g. staff, building maintenance etc. Funders have often made up their minds about the interventions and approaches needed to tackle an issue and then ask small charities to help deliver the work. The organisations we spoke to would like to see a more collaborative approach between small charities and public and private funders. One organisation was approached by a funder to deliver some workshops on the Prevent agenda. However, no thought had been given by the funder to how the work would be sustained after the workshops. The organisation agreed to run the workshops and planned to use some of its own resources and capacity to sustain the work. People felt that, in Ealing, some charities have more of a voice than others in decision making processes around funding and commissioning. So what might help? One participant talked about the need for improved channels for communication between the local charity sector and public funders. And one public funder admitted it is asking itself how it can best use the limited resources it has to support the fundraising capabilities of the charity sector in Ealing. Some decision makers and funders have a bias in favour of certain charities or individuals within charities. Politics including attitudes to race may also have an influence. Smaller charities recognised the value and importance of understanding the wider ecosystem of service delivery and funding structures. However, finding the time to attend meetings and knowing which meetings are going to be a worthwhile investment in time and resource is challenging. The CEO of one organisation comes from a Council background and so has an understanding of the workings of the Council but also a strong understanding of the needs in the community through the work that the organisation does. She is therefore able to help bridge the gap between the community and different public sector agencies. The organisation spends a lot of time building relationships and running awareness raising workshops about the work that they do, ‘We plonked ourselves where they were. You won’t be included unless you’re there’. The organisation said that its work has now become embedded within the policies and procedures of some Council teams. 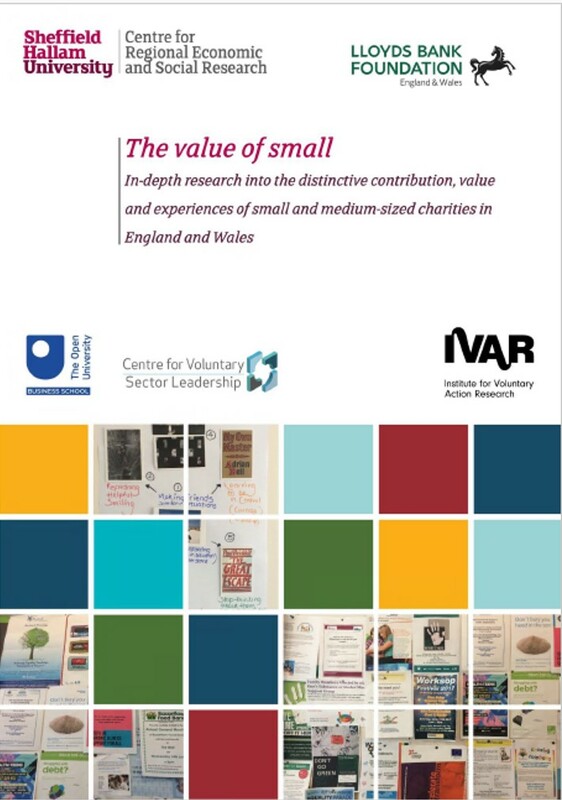 In-depth research into the distinctive contribution, value and experiences of small and medium-sized charities in England and Wales. 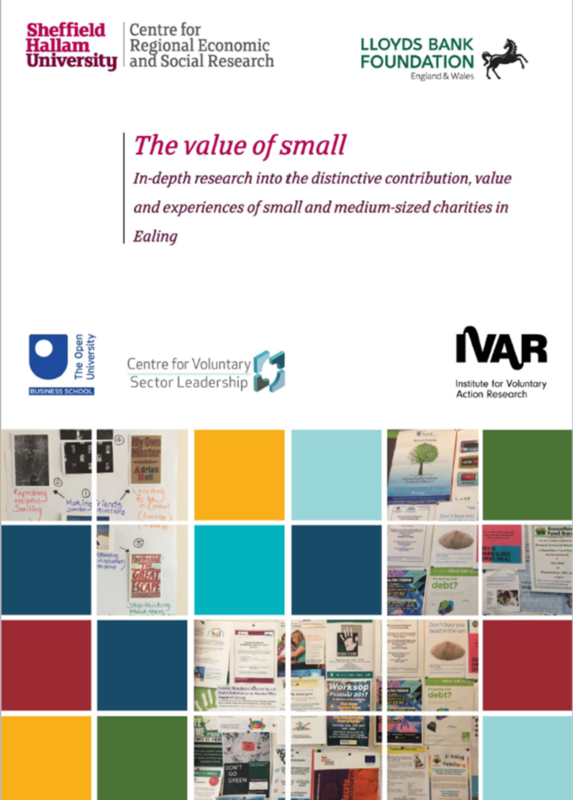 In-depth research into the distinctive contribution, value and experiences of small and medium-sized charities in Ealing. Find out more about our approach to research, our services and the methods we use. Tell us what you think about our website. All feedback is welcome.